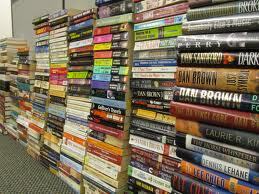 Every spring, ERC members and friends donate books and magazines that are then sorted and delivered to the Brookfield Library, Literacy Services of Wisconsin, Capital West Academy and Waukesha County Jail. The library gets the magazines that are first affixed with a sticker noting that it came from Elmbrook Rotary. Soft covered books to the jail, hard covered to literacy services of Wisconsin, and CWA gets the children's books. Again, thanks to everyone who donated and took part in delivering the materials to each location.